The dock power pedestal is the starting point for the shore power system. The most common shore cord in the US is a 30A, 50' which is the best companion for the waterproof connection you create by connecting it to the boat. You will need to connect the cords in a way that avoids polarity issues and offers safety even when plug twists in the clockwise direction. What type of shore cords does your boat need? The type of shore cords will depend on the size of your boat. While small boats can do with cords that provide less power, larger boats will need different cords as per its power requirements. Assuming that 50A service is offered by your marina and that you have a large boat, you will need a 50A 125V cordset. The reason to choose these cordsets over 30A is that their capability of handling amperage is more. You may also find that some boats are using two cordsets – 30A each. If you wish to run large appliances like a stove, it’s better to choose a 50A cordset. Shore cords are available by the foot and you can take accurate measurements to save yourself some big bucks. If you do not know much about which shore cords to buy, it’s always advisable that you seek help from professionals who know your boats like the back of their hand. Also, you will feel satisfied if your boat is in the right hands. Along with shore power cords, you will also need other accessories without which you won’t be able to power the appliances. This includes plugs and receptacles amongst other items. You need to ensure that the shore cords that you are using, do not have an altered bent terminal. Also, you should never try to force a plug as it can be injurious to your life. It’s important for the plug to fit snugly and also stay intact. 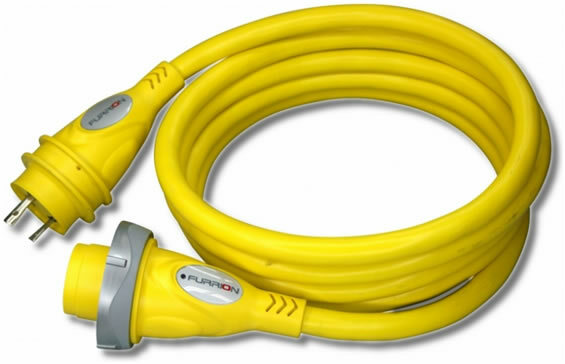 You can’t risk buying the wrong shore power cords for your boat. This is why LineBagz provides you with professional help to choose the right cords and sail away on the journey of your life. Need to find out more about our impeccable services – call us on (954) 343-8810. You can also send us an email on sales@linebagz.com. We’re always glad to hear from you (and we’ll prove it by replying to your message within hours).